Here at Ultrasafe Fire Suppression we often find ourselves directly working for mechanical engineers and contractors. At this stage it is common to find that a sprinkler system has already been detailed as part of the overall mechanical and electrical specification for the building. If this isn’t the case then click here to see what potential design savings could be made. Many of our customers are often surprised about how different a domestic and residential fire sprinkler system is when compared to a commercial system. For a start, CPVC pipe-work is used extensively allowing for quick and simple fitting, electrical loading and area to fit a water pump and tank are smaller and sprinkler heads are of a concealed type. 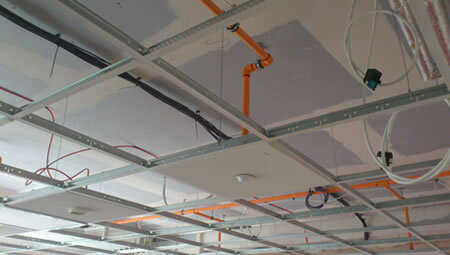 1st fix – CPVC installed, sprinkler heads are gauged to a known datum and the integrity of the pipe is tested. 2nd fix – install the sprinkler delivery system. Final fix – install the audio/visual system and fill the system with water. Our requirements really depend on the type of sprinkler system specified although in each case a known ceiling datum must be agreed to ensure that all sprinkler heads are perfectly gauged.Co-ordination with the lighting layout also helps as we can ensure where possible that sprinklers are symmetrically aligned with other in-room features. Trading for over 10 years we as a company, Ultrasafe Fire Suppression operate to an audited ISO 9001 quality management system and carry all the necessary insurances (including public indemnity) to give you full and total peace of mind.